In Stage Fright, Animals and Other Theatrical Problems, Nicholas Ridout writes about the moments when theatre breaks down. His book investigates all those glitches – the stutter, the laugh, the unexpected interruption of a creature on stage – when the theatrical machinery temporarily halts and we see the true nature of the event unfolding before us. In Ridout’s words, “something of our relationship to labour and to leisure is felt every time the theatre undoes itself around the encounter between worker and consumer”. Dmitry Krymov’s take on A Midsummer Night’s Dream – or more accurately, on its play within a play, Pyramus and Thisbe – looks a lot like Ridout’s thesis writ large. This is not really about love or fairies or Shakespeare; this is about theatre. Theatre in all its pretending, its failure, its illusion, its beauty, its exquisite silliness. It is also theatre as work. It is more than just comedy that has drawn Krymov and his company to the Mechanicals in Shakespeare’s play; they also represent, as their collective title suggests, the labour that goes into stage illusion. In a programme note, Krymov says that he couldn’t see himself in either the courtly or the magical worlds of A Midsummer Night’s Dream. “I am not a fairy,” he explains, “I am a craftsman.” Theatre is not magic conjured from thin air – it is craft. Recently, while interviewing playwright Alistair McDowall, we talked about the idea of theatre as magic trick. We agreed that the reason this particular analogy works so well is that it suggests both the thrill of illusion and the strings that make everything work. As audience members, we at once want to see the workings – the workings that we know to be there in the background – and to be taken in by what we see before us. To contradict myself, theatre is magical, but magical in the sense of a magic trick; we know that skill and work goes into it. As in the usual staging of the play within a play in A Midsummer Night’s Dream, Krymov’s production positions us both as the audience of Pyramus and Thisbe and as external observers of another audience: the courtiers the Mechanicals have been charged with entertaining. In this imagining they are haughty and distracted, checking messages on their smartphones and interjecting with their derision, disapproval and occasional outrage. If we see a picture of ourselves, it’s not a flattering one. As for the players, they’re a suitably ragtag bunch, trussed up in scruffy black tie like children playing dress-up. Their set and props, meanwhile, are crudely thrown together, even down to the sawdust coated scaffold on which their audience are directed to sit. There’s no forgetting that these are labourers and that the show they (eventually) present is as much a construction as their wonky, makeshift auditorium. So it’s all the more extraordinary when we do, by some strange theatrical alchemy, get drawn into the tale being told. 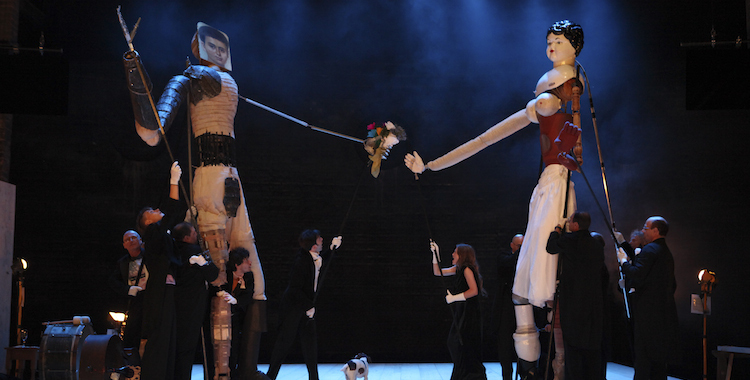 After a lengthy introduction, lightly touching on ideas of art, entertainment and intention, Krymov’s Mechanicals finally get around to the story of Pyramus and Thisbe, who take the form of two towering, mismatched puppets. Pyramus has a portrait for a head; Thisbe balances precariously on one ballet shoe and one boot. They are fragile and ridiculous – not all that different from their human operators, then, or the theatrical event itself. At first, what charm us are the tricks. Acrobats balance and somersault; the Mechanicals’ dog – the indisputable star of the show – even turns a backflip. We are at the circus, operating in an economy of gasps and giggles, occasionally ruptured by an interjection that causes a stumble, a mistake. Then something unexpected happens. Under just the right light, with just the right musical accompaniment, there is something incredibly tender about this pair of ungainly figures, and something happens that pretty much never happens in other Dreams: we feel for these star-crossed lovers. But these moments are brittle – easily snapped. One sequence from a long procession of images stands out. In the glow of their initial ardour, Pyramus and Thisbe dance. This is no effortless waltz; the meeting of the two puppets’ bodies is a frenetic feat of manoeuvring, requiring a large team of performers. Watching the rickety figures spin around the stage, two opposing things become simultaneously true: the moment is both beautiful and oddly moving, and at the same time conspicuous in its feverish craft. Labour and illusion at once – the magic trick. “This is the nature of theatre,” Krymov states elsewhere in the programme, “this is how theatre is created.” Precisely.